Writing is, at its core, communication. If you are unable to communicate your point to your audience, you fail. Regardless of how well-thought out your argument is, how large your vocabulary, or how salient of a point you’re making…if people have no idea what you’re talking about, it’s all for nothing. Luckily, we can quantify that clarity with something called your readability score. With it, you can make sure the content of your website always reaches the broadest audience possible. In general, it’s how easy to read your content is. Sounds obvious, right? But because people read at different levels, what a Master’s student considers readable is different than what a freshman in high school does. What’s readable to me might not be readable for you. And if you write only to what’s readable for you without taking into account others, there will be misunderstanding, ambiguity, and frustration around your content. Thus…the readability score. Like we said, there are multiple readability tests that you can use, but one of the most popular is the Flesh-Kincaid readability score. Most online tools that look over your text for readability (such as Readable.io and Yoast SEO), have a Flesch-Kincaid score built in. With that in mind, let’s take a look at that scale in particular. Flesch-Kincaid uses a scale of 1-100. The higher the score, the easier it is to read. Flesch wrote a great article on how to find your score manually, and he gave a pretty simple explanation of how to use the 0-100 scale. You can also use this formula: Multiply the average sentence length by 1.015. Multiply the average word length by 84.6. Add the two numbers. Subtract this sum from 206.835. The balance is your readability score. The scale shows scores from 0 to 100. Zero means practically unreadable and 100 means extremely easy. 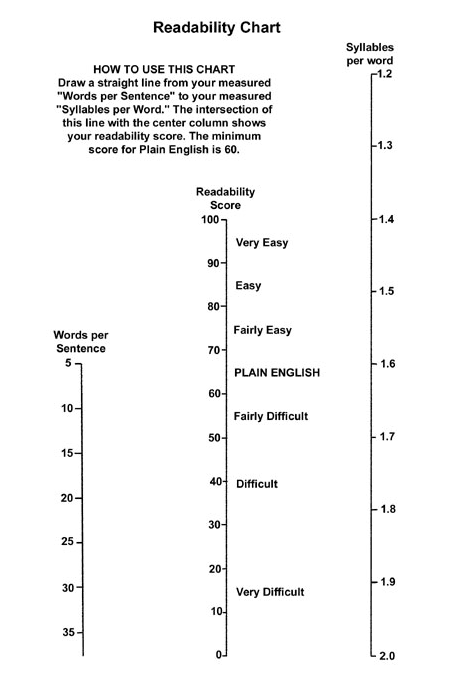 The minimum score for Plain English is 60, or about 20 words per sentence and 11/2 syllables per word. Conversational English for consumers should score at least 80, or about 15 words per sentence and 1 1/2 syllables per word. Here’s a quick reference chart he made for it. There are tools out there that do this for us, thankfully. But doing this a few times on some of your pieces of writing gives you a good idea of where you stand. Wikipedia even has a useful chart to show grade-level equivalency for the scores. Flesch said that we should be aiming for an 80 on the scale. That means we should be looking at a 7th grade reading level (that’s 12ish years old in the United States). When you consider that age, it can take some care to make all your writing readable by that range. Especially if you are working in a highly technical field or trying to explain a particularly complex issue. Some tactics like not using technical jargon (such as referring to an ethernet cable solely as CAT5) are fairly straightforward. But making sure that your sentence length is appropriate for your target audience or that your headings are broken up by few enough words aren’t as easy to eyeball. Especially if your audience isn’t the general public, but a slightly more advanced readership. For instance, this article scores a 67.8. That’s fine because you’re a technical audience with a foundational knowledge of the subject. Now, let’s look at some of the tools you can use to keep your writing as accessible as possible. Having a good readability score is so important to publishing successfully that you will have no problem finding both free and premium services to check your work. No matter your budget, there is something out there to help you get a better readability score. One of the most widely known writing tools on the internet, Grammarly tells you in real-time (if you have the browser extension installed) what parts of your writing need to be either clarified or are straight-up wrong. In the free version, you get spelling, punctuation/mechanics, and basic grammar checks. In the premium version, you get all that plus word-choice suggestions, more complex grammatical analysis, and more in-depth checking across the board. Given that you can have the real-time checking for free with a simple browser extension, you should definitely check it out. I personally run everything I write through Grammarly at least once because…why not? A premium option you have is Readable.io. While the service is paid, the plans start at $5 per month for their basic services. You can scan existing content by URL or as a file. They provide downloadable reports and email scanning, too. If you go into their higher tiers, you can simply put in the primary URL of your site, and they will scan the entire thing and send you a report of what works and what doesn’t. You also have the choice of automated alerts is something goes wonky — perhaps if a contributor doesn’t meet the standards and the work needs to be fixed. If you’re truly serious about making sure your audience gets your best foot put forward, Readable.io is an option. Coming into third (though this is in no particular order) is the WebFX Readability Test Tool. This tool is impressive. What’s even more impressive is the price. It’s free. Not only can you copy/paste the entire text directly to be analyzed, insert a single link at a time, or even include a button in your footer or sidebar where you can dynamically check any page on your site. When you get the results back, you get not only the Flesch-Kincaid results, but also the SMOG, Gunning Fog, ARI, and Coleman Liau scores. Plus the breakdown of how each score was calculated. For a free tool, you can’t get much better than this. I mean, just look at that analysis you get from just copy/pasting a URL. There are a few players in the readability and SEO game for WordPress. And if you want to get some useful info in your dashboard, you can for free. In general, WordPressers look to Yoast for the readability score for their posts. They do so because over the years, Yoast has made such an impact that many of the previously used plugins have not been maintained (but still exist on the repository). That doesn’t mean Yoast is your only option, though. There are some good alternatives still being maintained. Yoast SEO is the big dog in this yard. Not only does it keep track of the keyword targets you’re writing for, but it also has a completely separate section dedicated to the readability of your posts. You are given a rating of red, yellow, or green depending on where your content falls on the scale. You are graded on a lot of different points, and you don’t need to get a green rating in all of them to be good. They’re just suggestions, after all. While getting a green (as in you’re good to go) rating with Yoast isn’t a guarantee that your blog will take over the internet, it’s a good indication that you’ve done enough to make it stand above the crowd. If there’s one company who knows what Google wants out of your content, it’s SEMrush. So when they put out a writing assistant plugin, you jump on it. 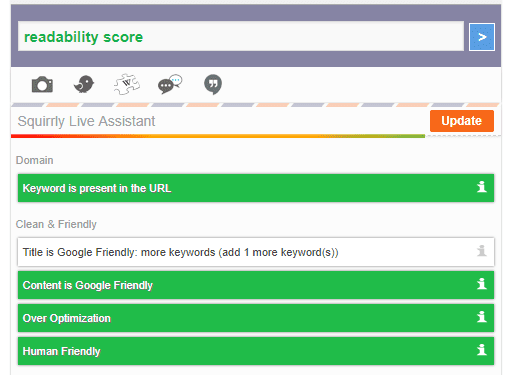 This plugin will go over your content, give you a Flesch-Kincaid score, suggest keywords based on your content, help you adjust based on the top Google results, and even check for plagiarism to make sure your content isn’t gonna get in trouble. Once your content is scored (in real time), you will get suggestions based on which sentences and words you can improve. SEMrush has proven themselves again and again. This is no different. If you’re not the type who wants numbers to rate your content, and you just want to know that it’s good enough for Google, Squirrly SEO is for you. Where the other tools give you a number on the Flesch-Kincaid (or another) scale for you to interpret, Squirrly tells you in what ways your content is adequate or inadequate. It also tells you whether or not you have keyword stuffed so much that your content is unreadable (the Over Optimization metric). Probably the most useful is when it tells you that the article is human-friendly or not. Because Google runs on algorithms and the Flesch-Kincaid is done by formula, Squirrly SEO looks over your copy and tests for semantic readability, not just mechanical and grammatical. This one is absolutely a contender for WordPressers who want to rank and get read. Readability is quantifiable. Obviously. We’ve gone over that a lot. But it’s because of that quantification that we can put together a quick list of rules for you to keep in the back of your mind. If you feel like you’ve been typing for a long time, full stop. It can be very easy to get into your flow and just keep typing. We have an idea, and we want to tell people. So we never use simple sentences. We use compound sentences because they’re able to get our point across better. Until they run on for multiple lines. People don’t read everything. They scan over content. They’re not going to read James Joyce-length sentences on a blog. Even if they’re the best sentences you’ve ever written. It’s hard to look at your own writing and say, “Yep, that’s written at an 80 on the Flesch-Kincade scale.” In fact, that’s almost impossible. Some of the best advice I have ever been given was to make sure that when you’re explaining something, break it down like you’d break it down for a child. That doesn’t mean dumb it down. Kids are smart, after all. They’re sharp. It means that you need to simplify it. Complex: To make sure it achieves escape velocity from the surface of the Earth, roughly 11.186 km/s, a rocket’s fuel must be carefully calculated, as the mass of the necessary combustible fuel will differ in the launch’s relation to the Earth’s rotation. Simple: Because fuel is so heavy, a rocket will need different amounts, depending on which direction it is aimed when it launches. Dumbed Down: Rockets go boom to get to outer space. That’s all it is. You don’t have to lose the overall concept, and you can adjust the amount of simplification at any time. However, if you think of how you’d explain the process to a child, you will come up with some extremely readable copy that you can then go back through and spruce up. People hate walls of text. Bulleted lists are great for scanning, and so are short sentences. On top of that, short paragraphs are great, too. In general, you never want a paragraph to take more than a handful of lines on your page. And try to add in single-line paragraphs every now and then for variety or emphasis. By breaking up the text visually and using the whitespace of your site, your readers will be able to more easily get the gist of your content. If you hit them with a 600-word wall of text with no whitespace to break it up, they’re going to bounce and not return. If you have trouble reading what you’ve written out loud, something is off. After all, the whole point here is to be readable. When the person who wrote the stuff stumbles over words, gets winded before a sentence is over, or just flat-out drones on and on, your text needs jazzing up. You might not be in an environment to read it fully aloud, but you can whisper quietly to yourself and get the same results. Fun fact: this is also a great way to get yourself back on track after a break. Just read the last few sentences out loud, and you will more easily be able to regain your train of thought. When I taught freshman composition, I told my students every semester to stop trying to sound like a writer. They thought if they wanted to succeed, they had to write in this grand, sweeping, epic style, using words they barely knew the meaning of (so they badly miscontextualized them) and couldn’t pronounce. When I would ask them to explain what a sentence meant — because I seriously couldn’t parse it — they wouldn’t be able to explain it, either. Like I said at the beginning, writing is about communication. We know how to communicate. We talk every single day. So my advice to you is the same advice I gave them: don’t try to sound like a writer. Write like you talk. While much of the internet today is populated by bots and run by algorithms, the content that we all produce is meant for humans. So it’s our job to make sure that real people can understand our work. Keyword stuffing, trying to sound too smart, or just getting excited and writing far too much without stopping can affect the readability of what you’re writing. 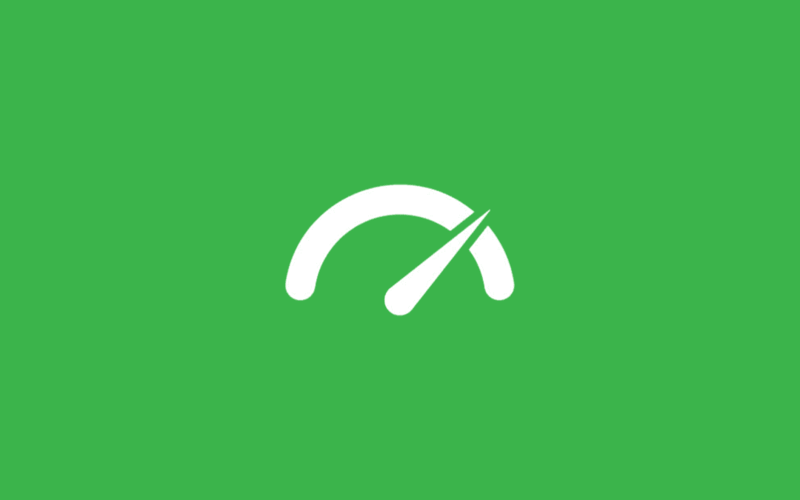 So whether you use Yoast’s plugin, manually work out the Flesch-Kincaid readability score on your own, or just take some of these tips and try to work them in organically, your readers will thank you. And so will your search engine rankings.